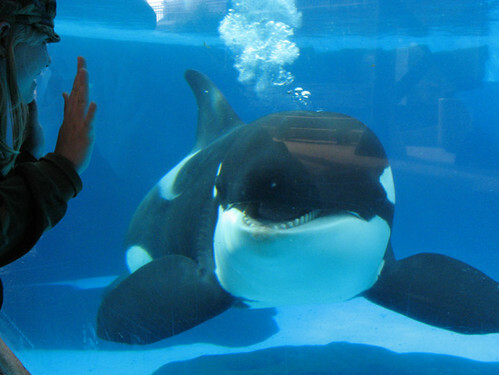 “We’ve just heard a rumour that Nakai (male , captive born at SeaWorld 1 Sept 2011 – mother Kasatka, father Tilikum by AI), currently held at San Diego SeaWorld, today hurt himself badly on his lower jaw. I’ve seen on a TINY thumb nail (as the original photo on ‘photobucket’ has been pulled). If true, it reminds me of the injury Tekoa suffered at Loro Parque, when he tried to slide over a safety bar. Trying to get more info, and will post if I do. Anyone else out there know anything about this, or have any pictures? Its time SeaWorld admitted that it is harmful to the physical and mental health of Orcas to keep them in captivity. Orca Injured At SeaWorld San Diego, PETA Files Complaint (PHOTOS) « Go to News!